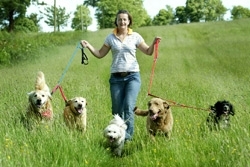 If you are going to be away all day, dog daycare may be just the thing for you. In a dog day care center, your dog will get to enjoy fun play sessions with other dogs as well as human company. This will help to socialize your dog and increase his confidence when facing new people and new dogs. It will also provide him with good mental and physical stimulation so that he will be calm and happy to sit by your feet when you get home. Leaving your dog home alone, all day, may cause him to get destructive, because he has too much energy, and bring about separation anxiety issues. Note that dog daycare centers are very different from the usual boarding kennels because they have many playgroups during the day where your dog may interact with other dogs. They also have nicer facilities, are commonly no-cage, and have trained staff to supervise your dog. Dogs that are most appropriate for daycare have easy-going, submissive personalities. My Siberian Husky is a very relaxed, easy-going dog, and she pretty much gets along with all the dogs and all the people she meets. We send her to daycare quite often. She enjoys herself and comes home happy and tired. My other dog, a male Shiba Inu, is a stress puppy. He likes routine and becomes stressed whenever there is any change, and whenever we are not around. I have tried putting him in two different daycare centers (one afternoon each) and he totally hated it. He came back very depressed and started whining in the car for several days thereafter. His temperament makes him unsuited for daycare. Make sure they have a competent and trained staff. Make sure that all handlers use positive reinforcement techniques, i.e. no hitting, no slapping, and no pinning your dog to the ground (alpha rolls). Rather than helping to socialize your dog, these bad experiences may make your dog fearful and aggressive towards other dogs and humans. Make sure the floors have a nice no-skid rubber surface and not concrete. If dogs run on concrete too much, it is bad for their pads. Make sure they are a no-cage facility. The dog daycare facility should have nice rooms with beds or a soft surface for the dogs to rest. The entire facility should be well ventilated so that it will be comfortable for your dog. It should have ceiling fans or air conditioning for the summer, and heating for the winter. Make sure that they group the dogs properly during play time (e.g., small vs big, active vs non-active). Make sure that the play-group assigned to each handler is not too large. This ensures that the dogs will be well supervised and reduces the probability of fights and bullying behavior during play. Make sure your dog is vaccinated for kennel cough. My dogs have gotten kennel cough just from staying overnight at an emergency room. Even though they try to be careful in these daycare centers, kennel cough is highly contagious. Daycare centers have a large number of dogs each day, that interact closely with each other, so there is a very high likelihood of catching kennel cough. A well-managed daycare center is a great place for socializing your dog to other dogs. Unlike dog parks, daycare play sessions are well supervised, by trained staff. The play groups are not too big, and they try to group dogs with similar size, and energy levels together, so they will get along. Daycare centers also have a dog meet-up interview, in the beginning. They will only accept social dogs that will fit-in to their facility. Many of the dogs there are also regulars and have had good practice on dog socialization manners. On the downside, daycare costs can be somewhat high. There is also a high likelihood that your dog may get sick. While daycare centers do require dogs to be properly immunized, it is difficult to detect and separate dogs that may have the cold or flu. Unless your dog has a strong immunity system, he may get sick more frequently from his exposure to large numbers of dogs.